The Village Sign stands in the Village Garden on the junction of Mundesley Road and the High Street. The original sign was given to the village by the Overstrand and District WI in 1977 but was replaced in 1993. The original Overstrand village sign actually featured Black Shuck. The current sign is double sided, the church featuring on one side and the village coastline on the other. 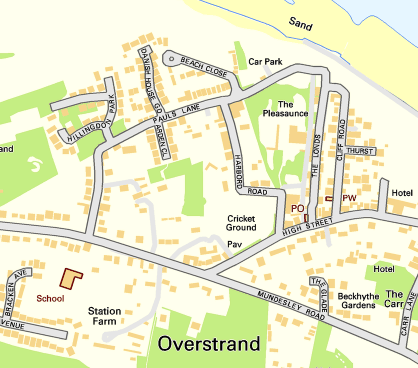 Overstrand, with a population of just over a 1,000, is two miles east of Cromer. It was once a modest fishing station, with all or part of the fishing station being known as Beck Hythe. In the latter part of the 19th century it was catapulted into prominence, and became known as “the village of millionaires”. As with much of the Norfolk coast, erosion was and continues to be a major problem. Clifton Way is an experimental site; its sea defences include riprap, wooden groynes, revetments, gabions and Offshore Reefs. The cliffs of soft boulder clay slump because of the water running through the clay, and the resulting material on the beach is removed by the succeeding high tides. In the neighbouring village of Sidestrand, the church was moved back from the cliff edge in the 19th century, though the tower of the church was left standing on the cliff top. Please bring your own pen. There is parking available in the street in adjacent to the village sign. The area is overlooking by residential properties and is busy in the summertime with visitors to the area so please be careful when retrieving and replacing the cache. The cache is not at ground level.